Would the children get a free, nutritious lunch? Did their school have running water? These are the kinds of issues Althea Pickering, who will become a “double ’Hoo” on May 20 when she receives her master’s degree in public policy from the University of Virginia, encountered when doing research in Kathmandu in March. Although she grew up in Charlottesville and attended the University for five years, Pickering has chosen some faraway places to learn about the world and set her sights on making helpful contributions to those in need. In the master’s program at the Frank Batten School of Leadership and Public Policy, she completed her applied policy project on the school health nutrition program in Nepal, working with the United Nations World Food Programme. As a UVA undergraduate, she spent a semester abroad in Mendoza, Argentina. She also traveled to New Zealand for a summer to work in organic farming, and one spring break she volunteered with Global Environmental Brigades in Panama. In earning her B.A. in global security and justice from UVA in 2017, she focused her studies learning about complex global problems, and decided the master’s program at the Batten School would be a good next step in gaining applicable skills, she said. She has worked as a humanitarian policy research assistant and as a graduate teaching assistant for Kirsten Gelsdorf, Batten’s director of global humanitarian policy. Pickering worked with Gelsdorf’s course, “Global Humanitarian Crises: Dilemmas, Leadership, and Action.” She also helped facilitate a three-day humanitarian field training session in late April with Gelsdorf and undergraduate students. Last summer, in advance of going to the Batten School, Pickering interned with the United Nations World Food Programme in Washington, D.C., where she helped oversee a portfolio of school meals programs across the world. “That’s when I knew what I wanted to do,” she said. That experience, and working with Gelsdorf and Batten School lecturer Galen Fountain, led her to focus on global food security for her applied policy project, which requires students to work with an external client. “Both professors have experience from their [public policy] careers and offered unique practical perspectives that you don’t often get in the classroom,” she said. Pickering wanted to continue working with the World Food Programme and designed her proposal to go to Nepal to evaluate the country’s School Health Nutrition program and offer recommendations to the government to improve the provision of these school-based services. Funded by the Batten School, she took that trip – it took 35 hours to get to Kathmandu – over spring break, extending the visit to just over two weeks and staying in a hostel for lodging. 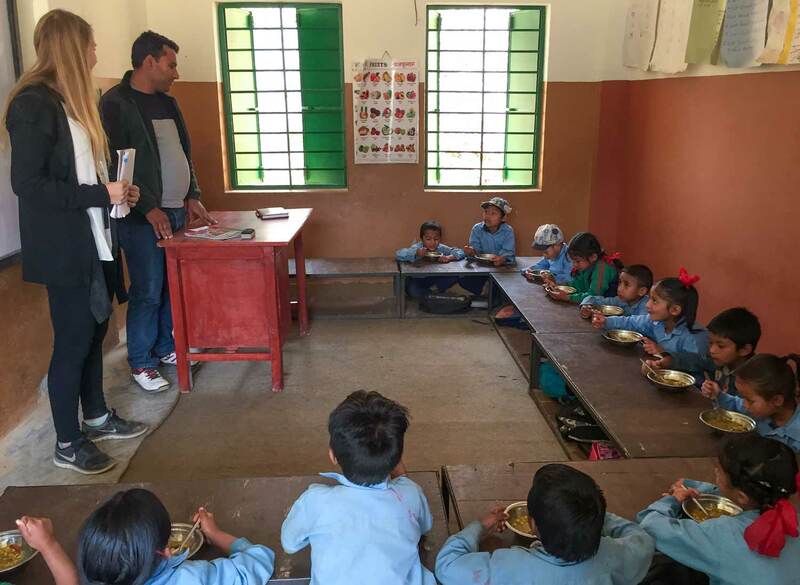 She conducted in-depth interviews, accompanied by a local interpreter, with a range of stakeholders, including school administrators, teachers and representatives from Nepali government ministries involved with the School Health Nutrition program. She observed the services and facilities of two Nepali primary schools in one of the districts affected by the catastrophic earthquake that hit the country near Kathmandu in April 2015. Pickering found that the services were unevenly provided. “The main challenges in School Health Nutrition implementation were coordination, resources, ownership, accountability, governance, and awareness,” she wrote in the summary of her report. The Nepali government is transitioning to a more decentralized structure that she thinks will help localities eventually have more control over their services, she said. She also made recommendations on how best to move forward to improve the services. The World Food Programme will present information from her report at its next conference with the government. And that’s not all – Pickering will join the World Food Programme in D.C. as a partnerships officer after she graduates. The organization is the leading humanitarian organization fighting hunger worldwide, delivering food assistance in emergencies and working with communities to improve nutrition and resilience. She knows her job will involve travel, but she’s not sure which countries will be in her portfolio. She said she hopes Nepal will be one of them, so she can visit again. “I’m excited for this next step,” Pickering said.